There’s no need to cook a whole breakfast because these muffins do it all in one! Savory, rich and satisfying, you’ll be anxiously awaiting the first bite as soon as you smell the mouthwatering aroma of the muffins baking in the oven. Cook turkey bacon in preheated pan until nearly done. Set aside. Using a round cookie cutter, cut 5 circles out of bread. Coat muffin pan with cooking spray. Lay cut out bread circle in 5 muffin tins. 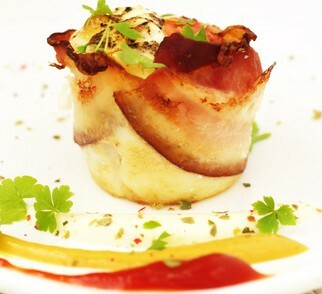 Wrap bacon around outside of each muffin tins. Combine eggs, seasonings, and 1/4 cup of Greek yogurt. Layer each muffin tin with the following: 1 tsp ricotta cheese, small handful baby spinach leaves, and 1 slice roma tomato. Divide egg mixture evenly among all 5 cups. Bake in a preheated 350 degree oven for 20-25 minutes or until eggs are firm to touch. 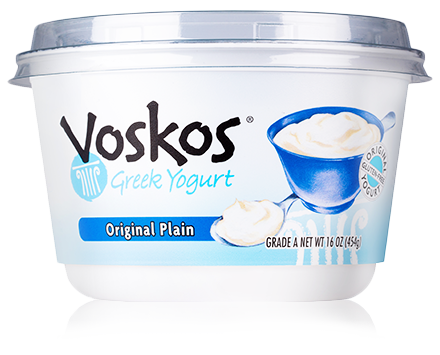 Serve with fresh sliced tomato and a dollop of VOSKOS® Greek yogurt.